I just want to thank everyone who helped my daughter Courtney with suggestions for the quilting of her Underground Railroad Quilt. She did tie it due to time restraints and it's beautiful. I forgot to take a picture of it after she sewed the binding on and it was due today. One more step in the graduation requirement is to do a 10 minutes oral presentation in front of 6 judges. She has to talk about the topic itself and the making of the quilt. She will present on Wednesday and she's scared to death!!! Here's a picture of the present for mom....all the civil war scraps from her quilt. Woo Hoo for me!! Not really a present for me seeing that I purchased all the fabric to begin with, but there is alot left!! I'll let you know how she does when she gets her grade for the project. How very sweet of your daughter to let you have the fabric scraps :-) Hope you can get a picture of the quilt to post. I love scraps. I bet they become something awesome. She will get an A!! probably an A+ no doubt in my mind!! She will have to get an A plus and it is so nice of her to give you the scraps...and we all love scraps! Will look forward with interest Karen in hearing how she goes with her report and the quilt. I have been a bad blogger and just getting caught up! Nice to hear that she had done well with the quilt. Looking forward to hearing the outcome. I love the scrap colors. I'm with the others I'm sure she'll get an "A". Good luck Courtney...you'll do fine with such a stunning quilt. 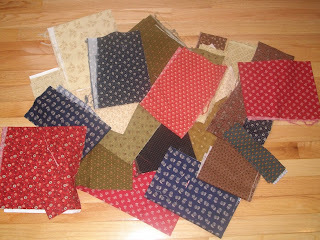 Great scraps to add to your stash...I'd love to see a picture of her finished quilt, too! Tell her congrats!